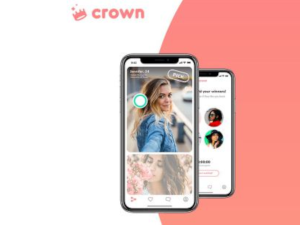 Match Group, the parent company of popular dating app Tinder, has launched a new app called Crown which offers a game-like format for online dating. It works like this: every day at noon, users are presented with sixteen total profiles, shown two at a time, and must choose only one “winner” from each group of two. Users go through a process of elimination, until you end up with the final four matches, at which point you choose one final winner to be “crowned.” That winner is then alerted he/she has won, but that doesn’t mean you start chatting right away - it’s up to the winner to choose whether or not he/she wants to message you. The game element is an interesting choice by Match Group. By turning it into a process where there is a possibility to “win,” the idea is that more users would feel invested in the process, and therefore be more likely to reach out. On the other hand, some argue, users might feel more acute rejection if their “winners” choose not to interact. Are you a private school alum living in the UK? You’re in luck – a new dating app called Toffee will be launching to connect you with other private school types. Toffee was founded with the notion that "people who hold similar views and values, and have shared the same life experiences (such as going through the same education system) are more likely to be attracted to each other and stick together," according to its website. There has been mixed response to the buzz the app is generating. Instagram posts and a short introductory video on the app’s website point to an elite clientele, with young men dressed in suits and tuxes and attractive women decked out in evening gowns, champagne at the ready. Many reviews are labeling it as another elite dating app, geared to help connect wealthy people. Worried about finding a date for your next event, a wedding, or even a dinner party? 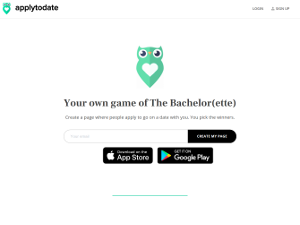 Apply to Date is a new dating platform that wants to help you put the word out, and like The Bachelor, encourages other seeking singles to compete for a chance to date you. Similar to networking apps like LinkedIn, the platform lets you build a sharable web page (like a resume) that allows people to submit applications to date you. You can add your social media, including tweets, Instagram bios, and Snapchat stories on your webpage profile, according to website Mashable. Apply to Date was created by Lucy Guo, who was looking for a date to her company’s office party and grew tired of swiping and messaging over apps like OkCupid and Tinder. Seeking a new strategy, she turned to her own personal networks, and eventually created a webpage asking people to submit their applications to go on a date with her. She was surprised when she received over 250 applications, and some from former friends she knew back in middle school. If cosplay is your idea of dressing up and your ideal vacation is a trip to a galaxy far, far away, a new app wants to help you meet your nerdy match. 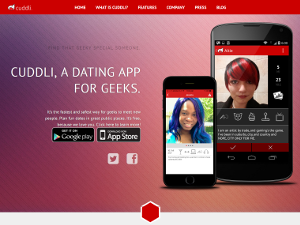 Cuddli, available on both iOS and Android, is a self-described “dating app for geeks” where single oddballs can bond over common interests, a shared culture, and that most important predictor of compatibility, fandom. Co-founders Steve Tauber, Robert Walker, and Pinguino Kolb designed Cuddli to be a safe and fun space where geeks are the popular kids and interests like gaming and Comic Con are celebrated, not ridiculed. There’s another new dating app with a catchy hook debuting this month, this time involving your DNA. Pheramor, described by news website Wired as “23andMe meets Tinder meets monogamy” matches its users according to their genetic compatibility. 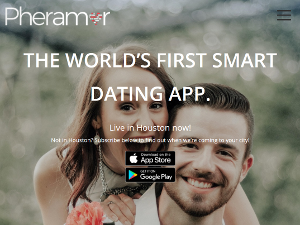 The dating app launched this month in Houston, Texas. For $19.99, Pheramor will mail you a kit so you can submit your saliva samples for testing. Then for an additional $10 per month, you can use the service and start receiving genetic-compatible matches. The company was founded by two genetics experts, so the science figures prominently into the matching process. If chemistry is detected through pheromones, then why not assume romance and love will follow? Pheramor is trying to separate itself from the hook-up reputation of Tinder and appeal to more serious daters. Fans of online dating cite access to a massive pool of potential matches as one of its best features. Detractors, on the other hand, call choice overload one of online dating’s greatest failures. If you fall into the latter camp, a new app is here to help ease the woes of overwhelm. Ditto starts out like any other Tinder copycat. Users swipe through profiles until they spot one that catches their eye. They swipe right to indicate interest, and a right swipe in return makes a match. That’s where things get interesting. On Ditto, matches are mutually exclusive until someone unmatches. Think of it as the dating app version of monogamy. A match can only be made with one person at a time, and swiping through other users is disabled until someone decides to end their current match.